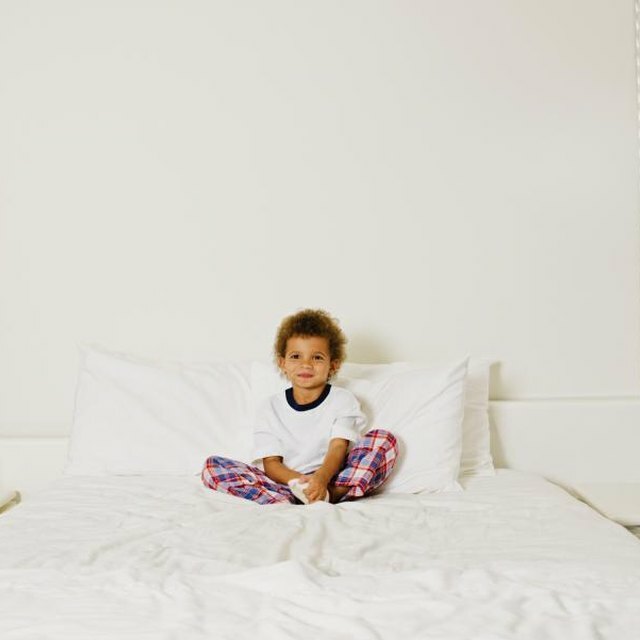 What Are the Dangers of a Kid Jumping on a Bed? Bunk beds are a functional alternative to traditional beds in a smaller bedroom or a room that must be shared by siblings. When decorating a room with bunk beds, don't forget that children need lighting for homework and play. Removable lighting options can be easily changed in the future if you redo the room's design and remove the bunk beds. Make bunk beds even more functional and fun with lighting. Never place a bunk bed near an overhead light fixture or ceiling fan due to the possibility of children on the top bunk hitting their heads or burning themselves on a hot light bulb. A child who hits his head on an overhead fixture may also break the fixture, scattering dangerously sharp glass around the bedroom, or fall off the top bunk. Choosing an overhead fixture for a room with bunk beds is not always an easy task. A ceiling fan is only an option if the room is large enough that it can be installed at a safe distance from the top bunk. Even then, consider that the person getting the majority of the circulating air and light in the room will be the person who sleeps on the top bunk. If the room is small, consider recessed lighting or forgo a traditional overhead fixture. Sconces built into the bed itself or installed along the wall next to the bunk bed are an easy way to give bunk-bed residents adequate task lighting. Make sure sconces installed near bedding do not use light bulbs that get dangerously hot. Place table lamps on desks, nightstands or custom shelves next to both the bottom and top bunks to meet the needs of those sleeping in both beds. For reading at night, use plug-in lamps that can be clamped onto the rails. To avoid having to wire in extra electrical outlets or fixtures, use battery-operated lights. Attach push-button lights along the rails inside the bottom of the bunk bed and along the wall next to the top bunk to give kids an instant glow whenever they need it. Old-fashioned flashlights are another option when you do not want to install permanent fixtures. Even if the bunk beds go when the kids move out, the flashlights can go with them as a reminder of nights spent reading under the covers during childhood. Rosallee Scott has been a freelance writer since 1998. Currently, her career is focused on creating informational articles for Web content. Though Scott's articles cover a variety of topics, her concentration is predominately on garden-related issues, decorating and interior design. Is a Light Above the Shower Safe?